I have come across many individuals who have studied Spanish in the past and want to be conversational but are very hindered by the negativity they received in high school or college classes. Now that you are an adult, you are learning Spanish to communicate; you are not trying to get a passing grade on a test. Although grammar is important, it should not be the focus when communicating your message. If you think about it, when you are listening to a non-native speaker speak English, you focus on the message. You do not focus on how many errors the speaker has committed. Such is it when speaking Spanish. The receiver will be pleased you are speaking in his or her native language and will focus on the message, not on whether you correctly used the masculine or feminine article or whether you correctly conjugated the verb. This article will offer you tips on how to best get your message across and what resources are available to help you learn or improve your Spanish. First, it is going to be very important for you to speak the language. If you are taking a course, or studying online, you are going to have to go out and practice. Head to the Hispanic part of town and strike up a conversation. Go to the local taquería and order in Spanish. 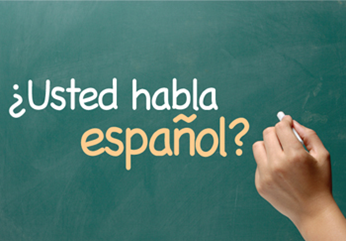 Volunteer at a clinic, food bank, or school where there are many Spanish speakers. This will be your opportunity to put into practice what you are learning and do some good in the community. Remember, you do not have to go abroad to learn a language, especially when there are so many Spanish speakers in our own country. After all, that’s why you want to learn Spanish, right, to communicate with people in the U.S? I’m sure many of you also enjoying traveling to the beautiful beaches in Mexico and Central America and maybe want to soak in the culture of Spain, but most people want to learn Spanish to help them with their employment opportunities in the U.S. or to expand the market of their own business. Here are some comments on resources that are available. Rosetta Stone: When I began market research for my language instruction company, I thought my biggest competition would be Berlitz, but I have had more people ask me about Rosetta Stone. Recently, Rosetta Stone has really ramped up their advertising and can be found in many mall kiosks throughout the country. Rosetta Stone offers a picture-based method for learning Spanish and many other languages, but it is quite expensive. You have to purchase each level as you progress. I used to refer people to online libraries who offered Rosetta Stone, but Rosetta Stone has since pulled their contracts from libraries so there is no longer free access to it. So, let’s say the program is good, and you can learn from it, but I must ask the questions, will you really sit in front of the computer for hours clicking on pictures to learn how to say, “The ball bounces,” and “The boy is riding the horse?” For more information regarding the effectiveness of Rosetta Stone, see my blog post dated May 31, 2017. Studies show that adults learn best when the material is relevant and important to them. So, if you want to learn Spanish for your house-building trip to Mexico, or to open bank accounts for your Spanish-speaking market, how important is “The ball is bounces” to you? Adult Education Courses: Many people do not know about adult education courses. I taught ESL through adult education for 15 years before founding my own language instruction business. Many high school districts offer adult education for free or very low cost. They are mostly known for their ESL, GED, and basic skills classes, but many offer conversational Spanish as well. Try a search on your favorite search engine for adult education in your area and you may be pleasantly surprised. For example, in the Silicon Valley area, I found Spanish and Japanese classes offered through Santa Clara Adult Education that were 2 hours a week for $104 for 8 weeks. That is quite a good deal indeed and you do not have to deal with complicated college enrollment and difficult parking and grades. The down side is it may be a crowded classroom and will not be tailored to your specific need, but for a budget-conscious student, it is worth checking out. Community College: Community colleges are another option for learning a language. You will have live interaction with a professor and students, and can ask questions and get quick feedback. The drawback here is that most students are taking the course for a grade. Emphasis will be placed on performance and correct grammar. You may sit through hours of lecture on verb conjugation and memorizing vocabulary lists. Additionally, the course I found in Silicon Valley was offered M-Th from 12:30-2:45, so you have to be available during the middle of the day, every day. This does not work for busy working professionals. The class I found was 5 units, so $155 for the units, plus $50 in fees and $27 for quarterly parking. For those of you interested in a free picture-based course, check out: http://www.trentu.ca/academic/modernlanguages/spanish/masarriba/. Also, free library access to a program similar to Rosetta Stone: http://www.mangolanguages.com/main. Also, check out the Duolingo app in the Appstore or on Google Play. Private Lessons: For those of you wanting to learn Spanish quickly and effectively, small group lessons is a good way to go, but it is more expensive than your other options. Make sure you research the company and/or instructor. Make sure you are hiring someone with years of teaching experience and a credential or two to his/her name. Do not hope you can learn Spanish from someone just because he/she is a native speaker of the language. If you think about it, would you be qualified to teach somebody English? The instructor needs to know about teaching methodology, grammar, and how adults learn best. Once you find a reputable company or instructor, you will be happy with the time and money you put in to learning Spanish that is relevant to your needs. For up-to-date tips on learning Spanish, become a fan of Habla Language Services’ Facebook page: www.facebook.com/spanish.esl or sign up for the blog at www.hablals.com. Gina Covello, MA is founder of Habla Language Services. Habla Language Services specializes in 3- hour workshops streamlined to get you communicating with the Hispanic market. Using a patent-pending method, she gives you all the tools you need to start reaching the market in your specific industry immediately. She has workshops for: construction, banking, health practitioners, missionaries and home owners. She also offers semi-private lessons. Contact Us for more information. This entry was posted in Learning Spanish & Bilingualism. Bookmark the permalink.